From an enrollment standpoint, PPO plans have the greatest enrollment in the West, and the least enrollment in the Northeast. HMO enrollment continues to drop across most of the country, but held steady in the Southeast, capturing 9.8% of the market in 2017. CDHP enrollment, meanwhile, is highest in the North Central U.S. at 46.3%, but grew in every region of the United States except the West, where it decreased to 14.7% of the market. Califor nia is often different, which is why we look at them both as part of the overall West and as a separate entity. 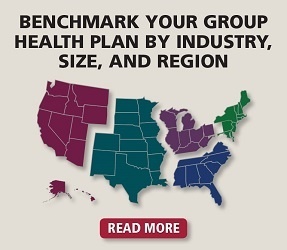 Looking at California alone, HMOs are king, followed by PPO plans, whereas, in the rest of the U.S., including the Western region, PPOs and CDHPs are the top two predominant plans. Similarly, although HMO enrollment continues to drop in general, HMOs account for nearly half of the plan types and plan enrollment in the state of California, at 50% and 48.9%, respectively.